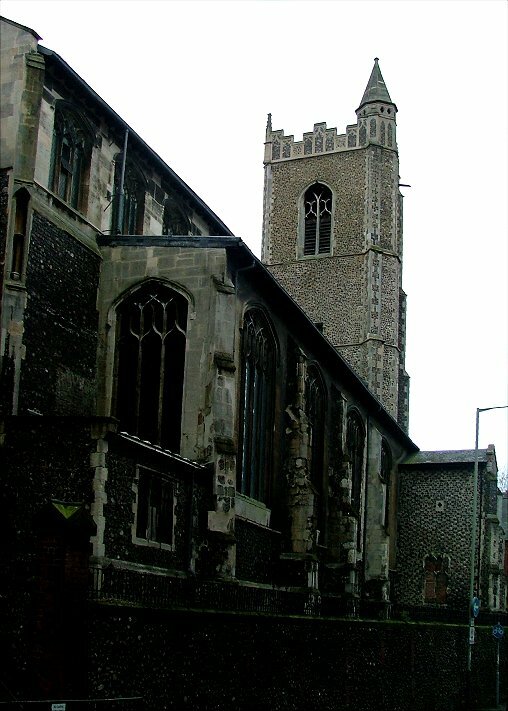 One of the staggering experiences of the church explorer in Norwich is the sheer proximity of one church to another. 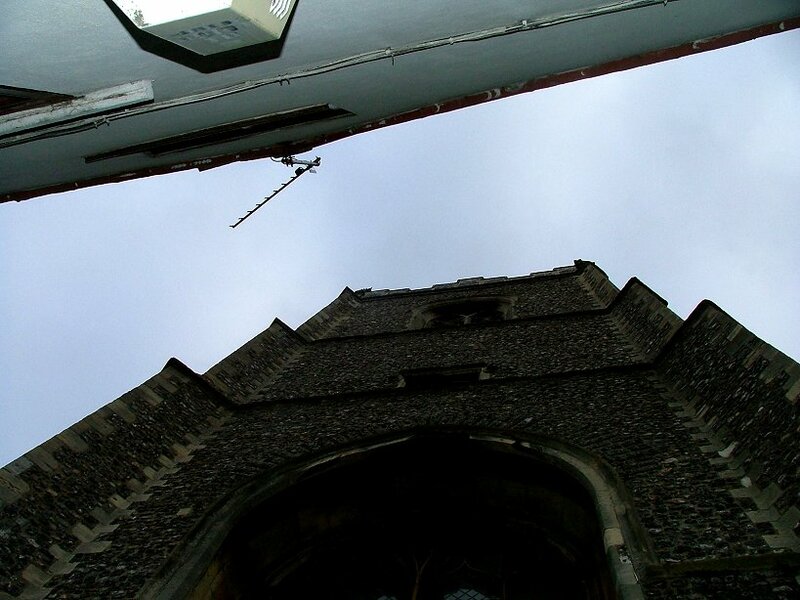 In a little over four hundred yards, you can walk past five redundant medieval churches in the length of St Benedict's Street alone, from the back of St Gregory to the ruin of St Benedict itself. 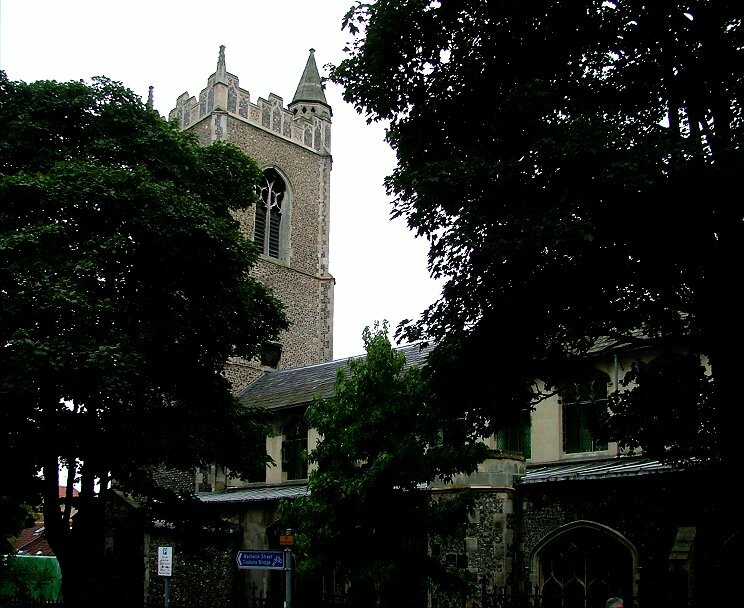 One of these churches, St Swithin, is now the Norwich Arts Centre, while St Gregory and St Margaret have occasional uses for exhibitions and concerts. 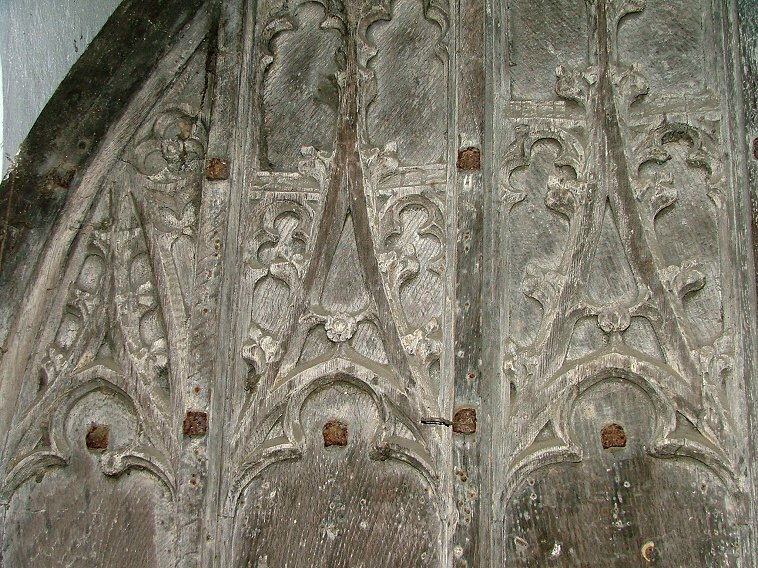 That leaves St Laurence, the biggest of the five, a grand and prominent landmark now in the care of the Churches Conservation Trust; without their loving care it would be little more than a rotting corpse. 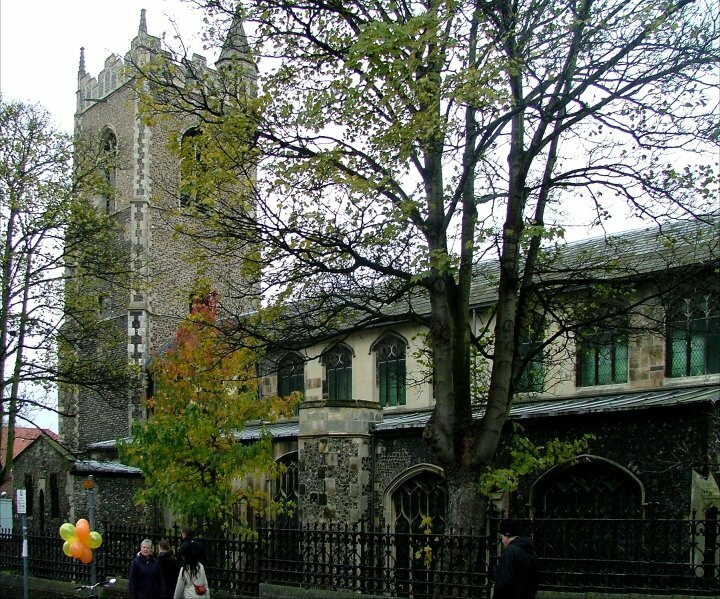 As it is, it is quite the biggest empty shell in the middle of Norwich. It was not always so, of course. This was one of half a dozen large city centre churches completely rebuilt during the 15th century. 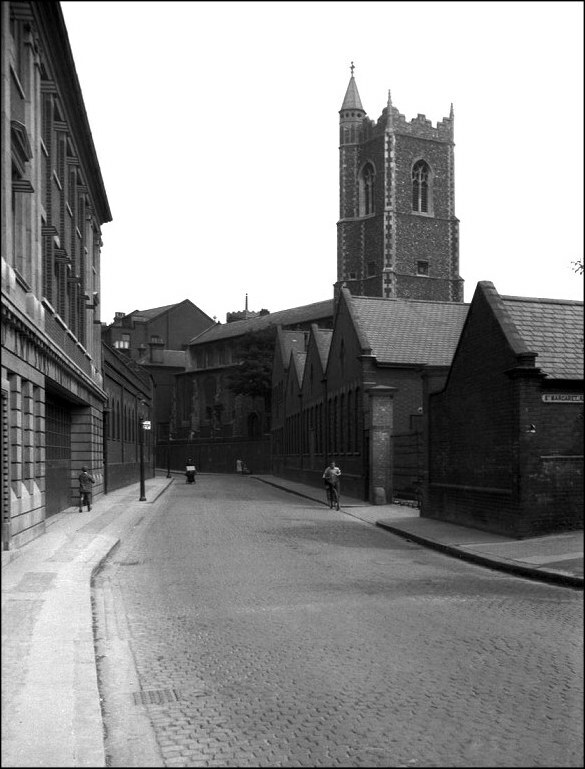 It took about sixty years, but nevertheless St Laurence is all of a piece, a textbook Perpendicular church. 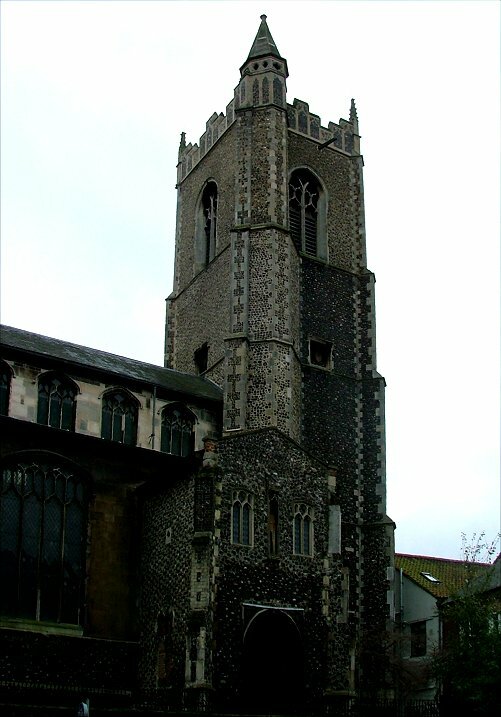 From St Benedict's Street it is not immediately clear quite how vast this building is; it is the third biggest medieval church in Norwich after St Peter Mancroft and St Andrew, bigger even than St Stephen. The clerestory is 12 windows long, and the mighty tower almost 120 feet high. It is more imposing from Westwick Street, standing high above the street like a fortress. 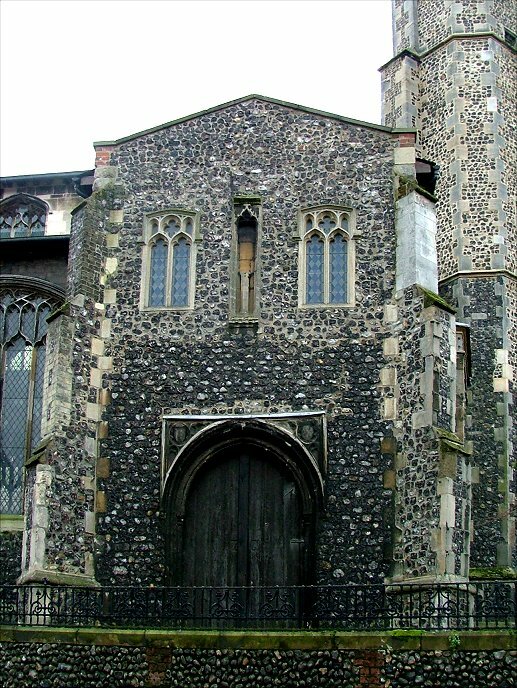 For pedestrians coming into central Norwich from Coslany, it is like a gateway to the city, far more impressive than the city walls. 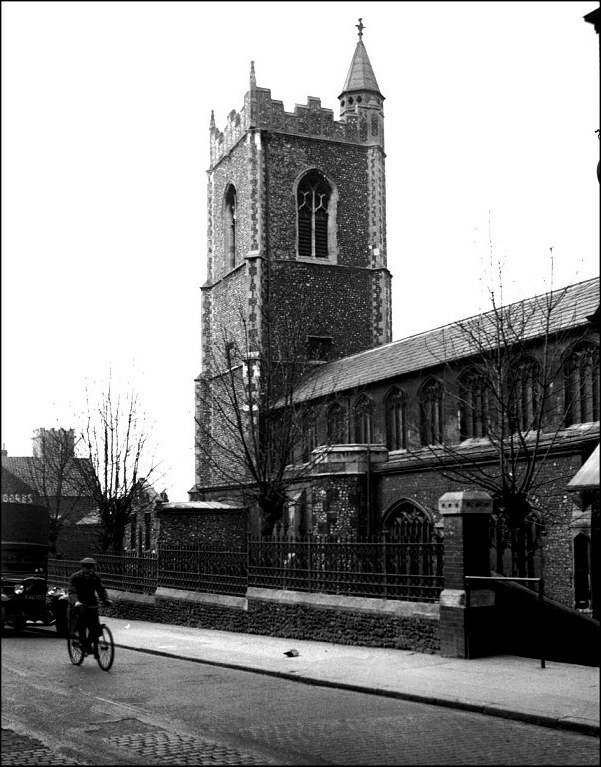 The spired stair turret on the tower is castle-like, especially in George Plunkett's 1938 images. One of the most interesting aspects of the exterior is the west doorway, easily missed and seen only from the narrow St Laurence's Passage. 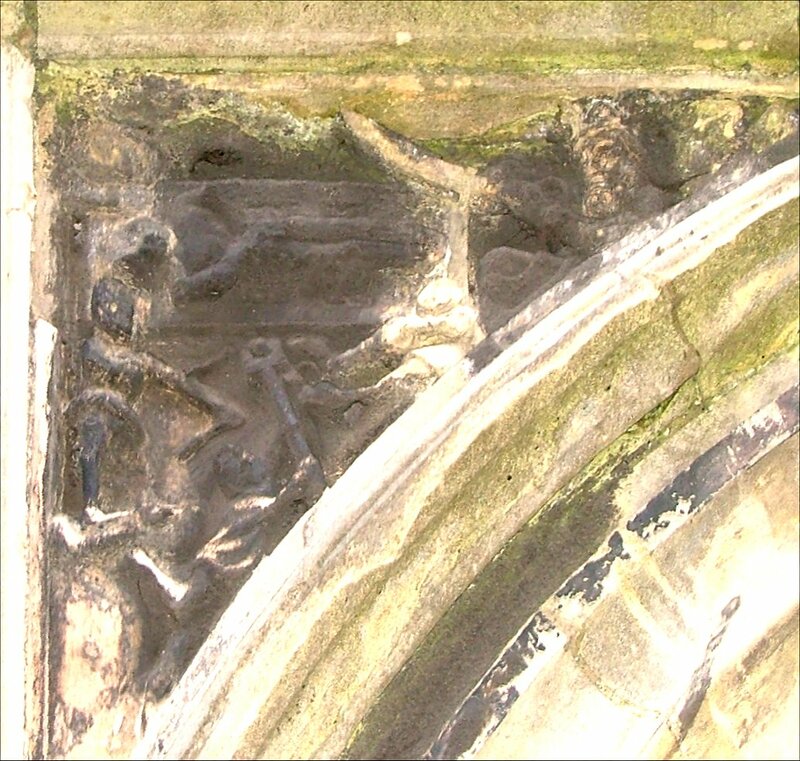 The spandrils feature two exquisitely carved martyrdoms, quite undamaged by time or the hand of iconoclasts. 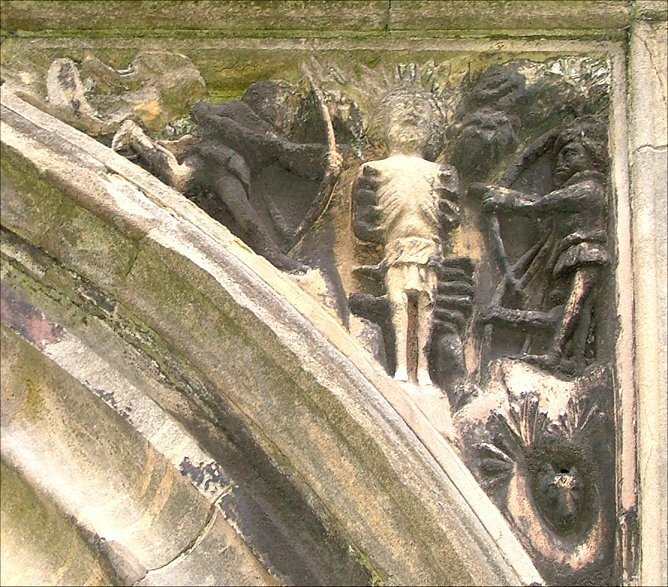 One is that of St Laurence himself, and shows him tied to the gridiron while the fire is prepared (St Laurence being the patron saint of those who cook on barbecues) , and the other is of St Edmund shot full of arrows. You can see them on the left. 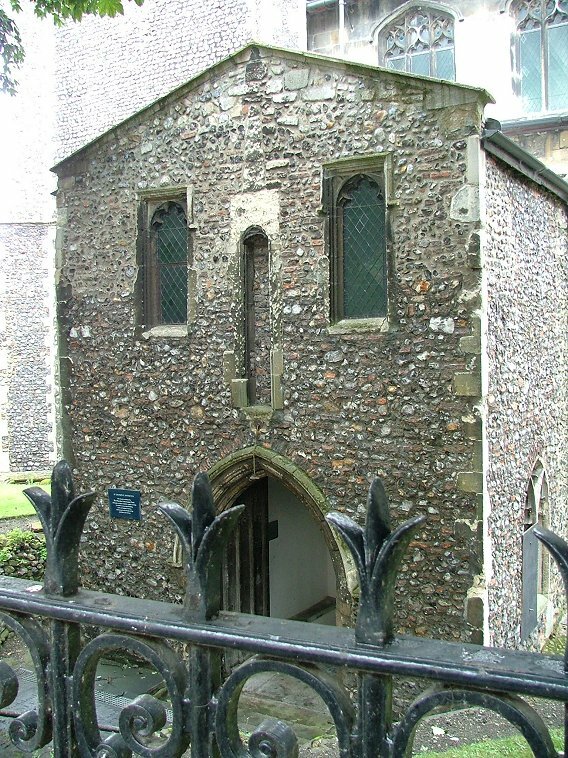 Above the passage, the great tower's height is accentuated by the narrowness of the gap to its left. 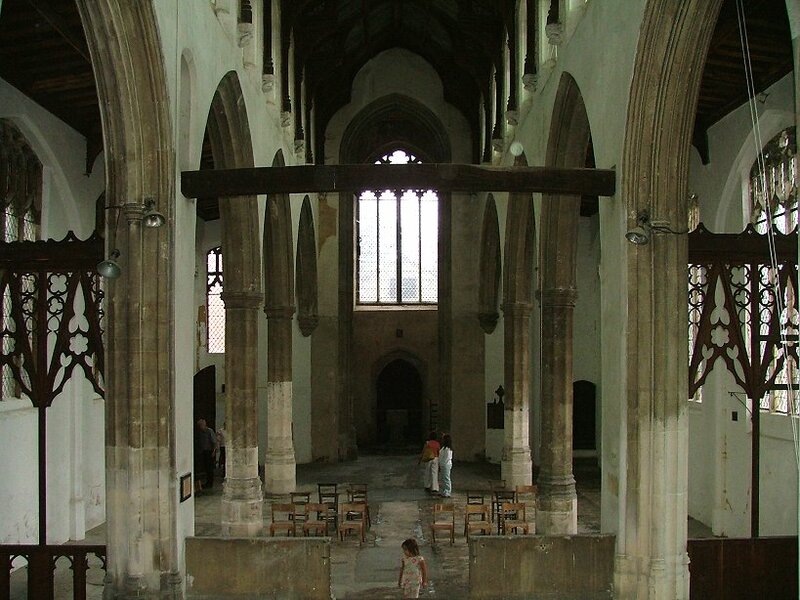 And the unbroken length of the nave and chancel is so high, too; the north side drops away to Westwick Street, and the floor takes this as its level. 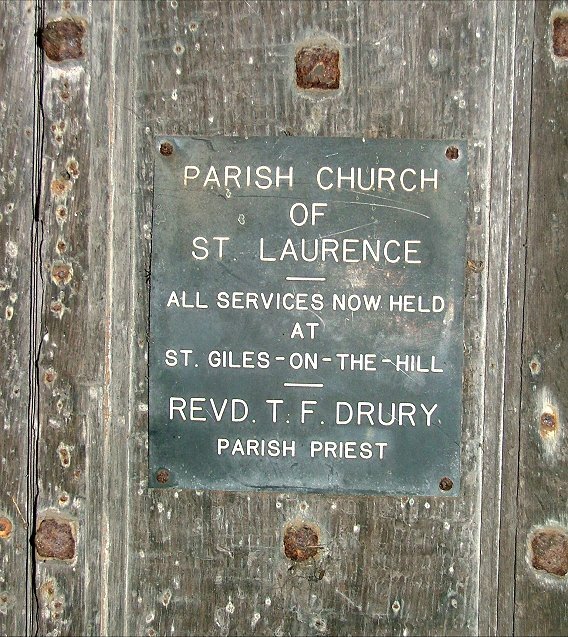 You step down a flight of stairs into the south porch, which is otherwise hard against the street, thanks to widening for trams in the late 19th century, and then through a 15th century door down into the church itself.. The sheer scale of this building is only apparent once you are inside. 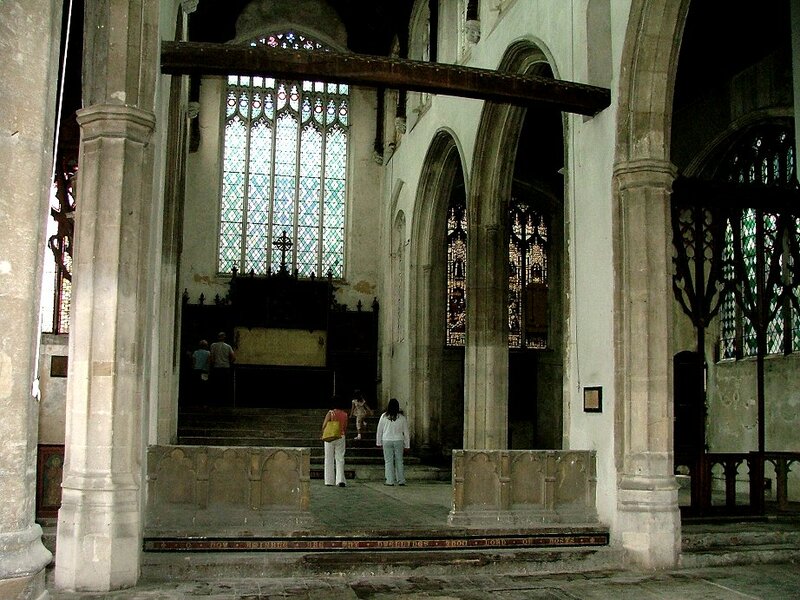 The roof seems absurdly high, the 1490s hammerbeam roof lost far off in the shadows. 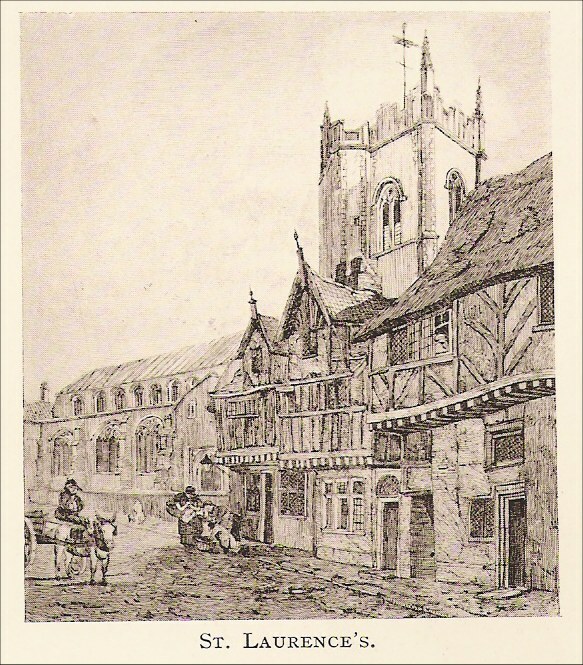 The arcades are less elegant than forceful, and the unbroken line, with no chancel arch, marches purposefully eastward. 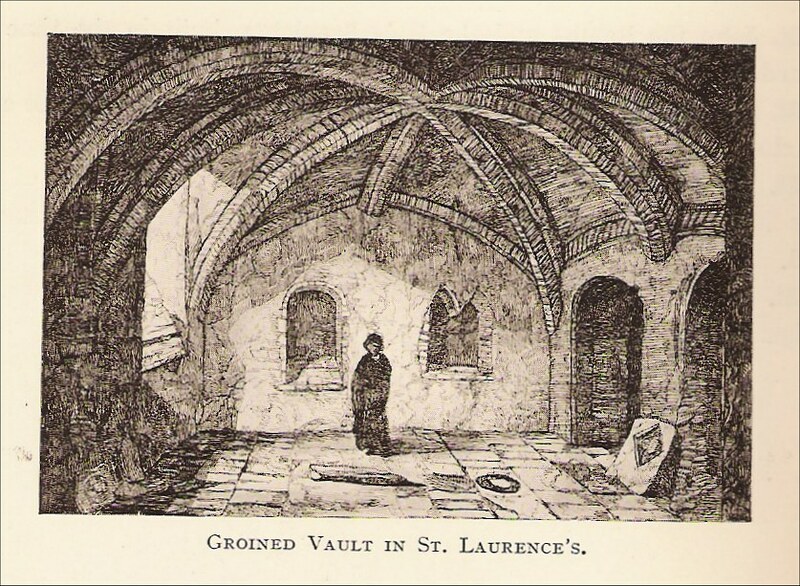 This is all accentuated by the fact that St Laurence is pretty much completely empty. Almost, but not quite. 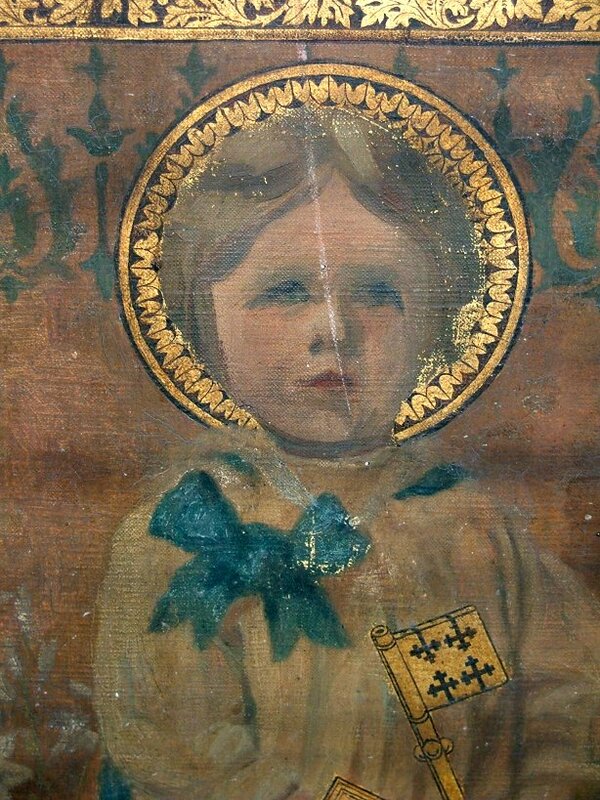 In the late 19th and early 20th centuries, St Laurence underwent an extraordinary makeover. In a city renowned for the excesses of its Anglo-Catholic churches, this was among the highest of the high. 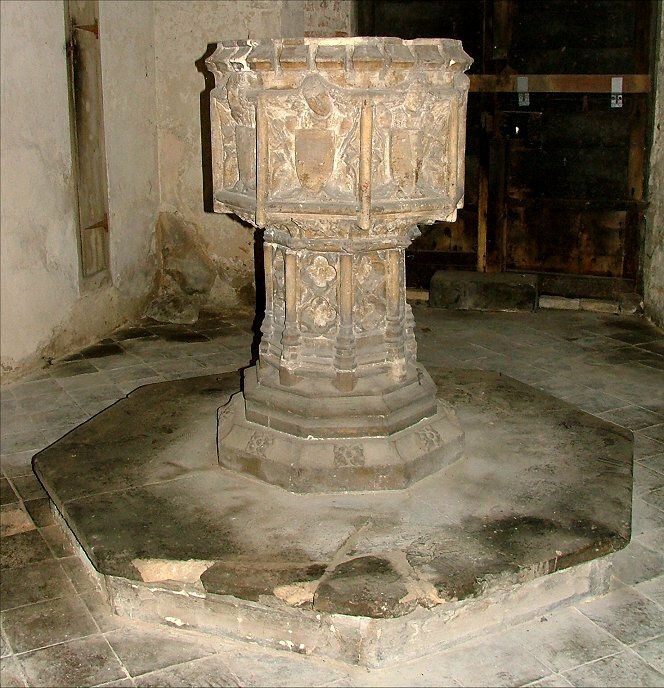 The sanctuary had always been raised above the level of the chancel because it goes over a large vault, shown in the old engraving on the left, as at Tunstead. 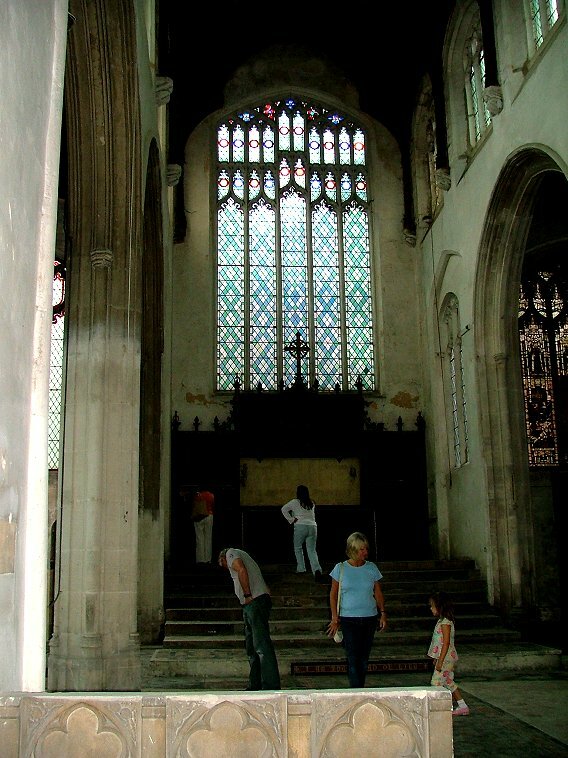 But here the entire easterly third of the building was elevated by the late Victorians into a great platform, a flight of steps leading through a stone screen and then again to the sanctuary, until the altar was fully twelve feet above the floor of the nave. 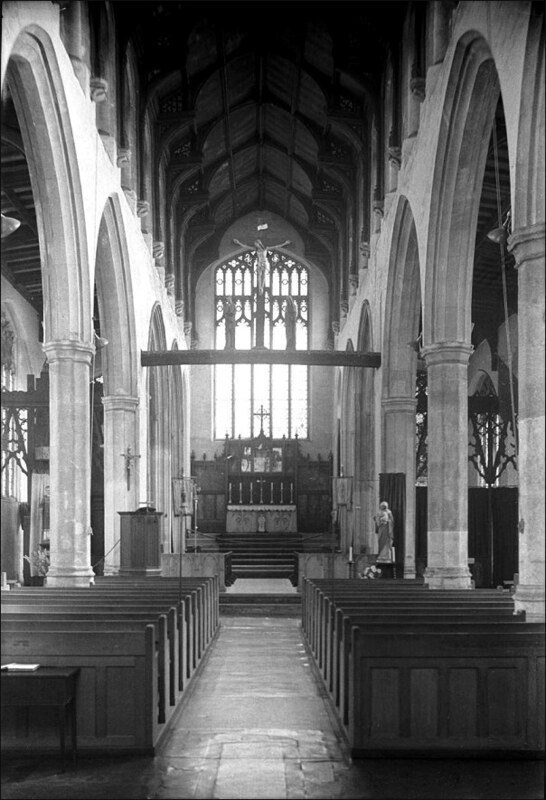 George Plunkett's 1938 image shows the interior with Victorian benches and a passageway accentuating the view east. 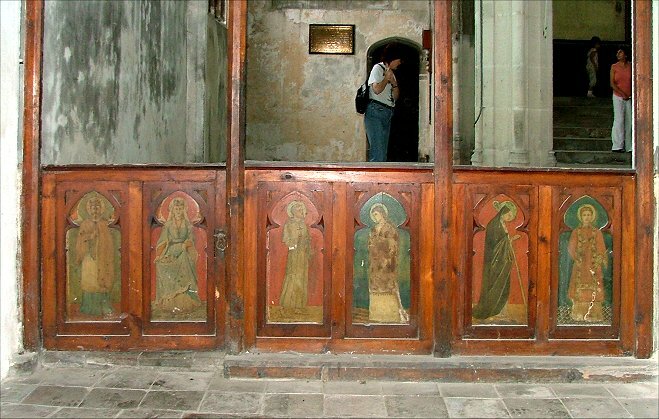 The altar and reredos are now gone, but the painted panels that flanked them survive. 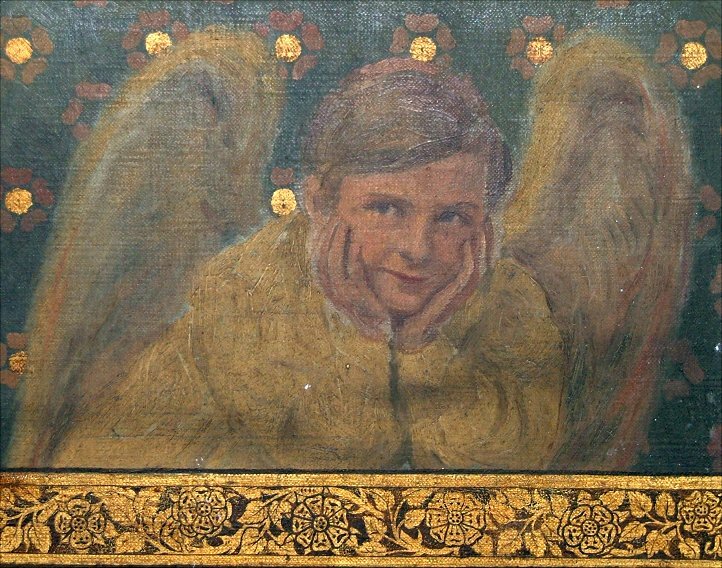 They depict angels and Saints, but the most curious thing about them is that all the faces are drawn from the life, little Edwardian boys and youths cloaked out in contemporary clothes, but wearing nimbuses and holding gilded symbols, and older men with wings and in armour. It is all at once grotesque and fascinating. 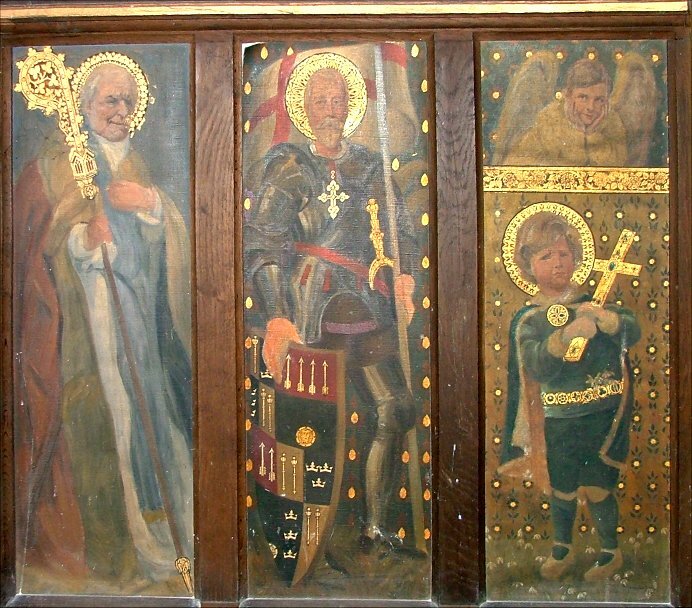 The reredos they flanked was the Parish war memorial, so they may be even later than they appear. 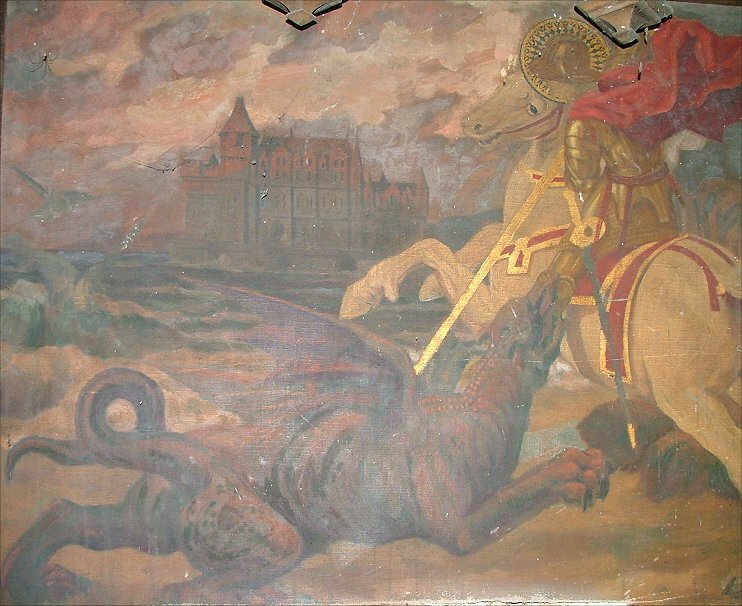 The screen to the north aisle chapel has panels painted in a similarly naive manner. 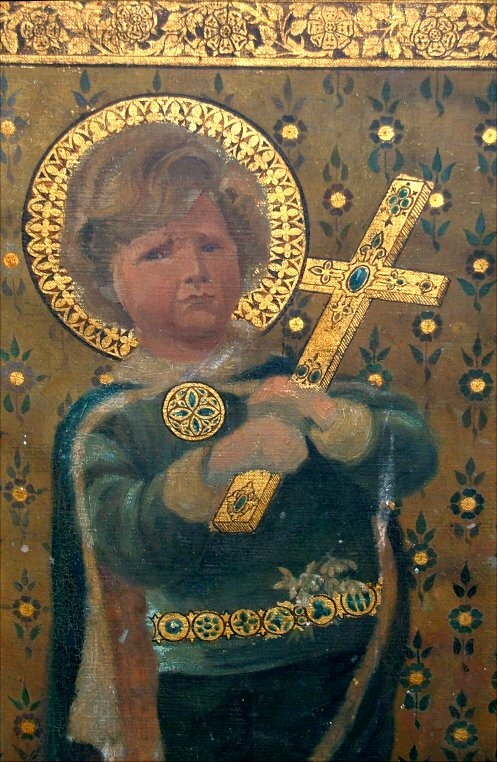 I strove to understand what it was that had possessed people to do this, but I could not. 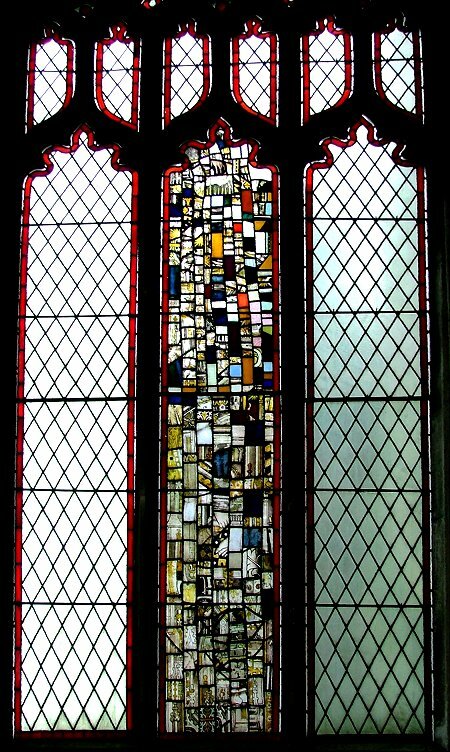 There is a 15th century font contemporary with the rebuilding of the church, and a scattering of medieval glass has been built into an abstract design in the north aisle chapel. 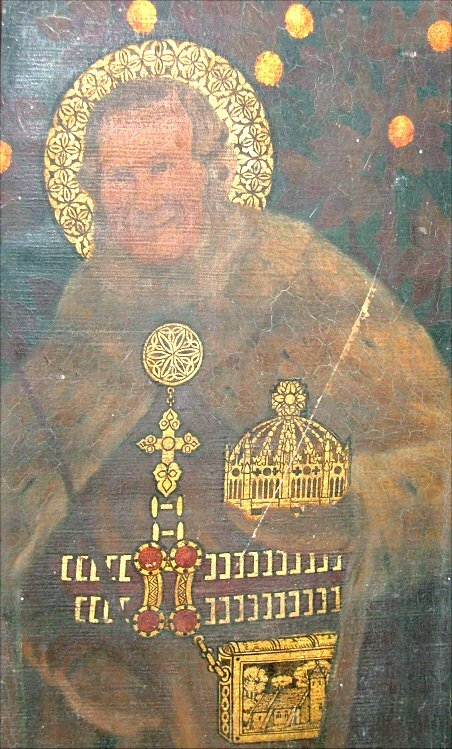 There were brasses, but these were removed; first to St Peter Hungate, and then into storage when the museum there closed. 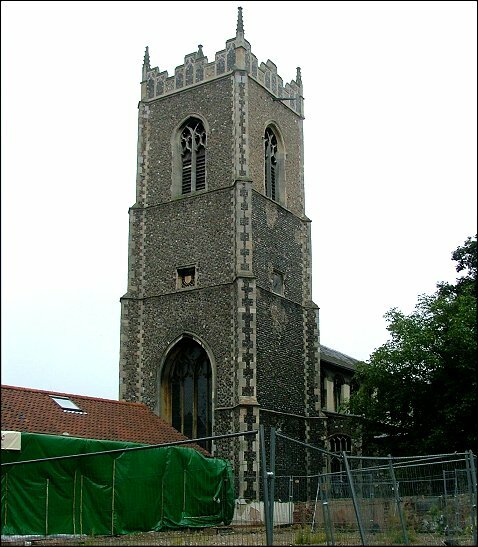 St Laurence was one of the 24 Norwich churches recommended for demolition by the Brooke Report, a shocking possibility that galvanised Lady Harrod and others into forming the Norfolk Churches Trust to defeat the philistines. Under the circumstances, it seems ungrateful for us not to actually do anything with the place. 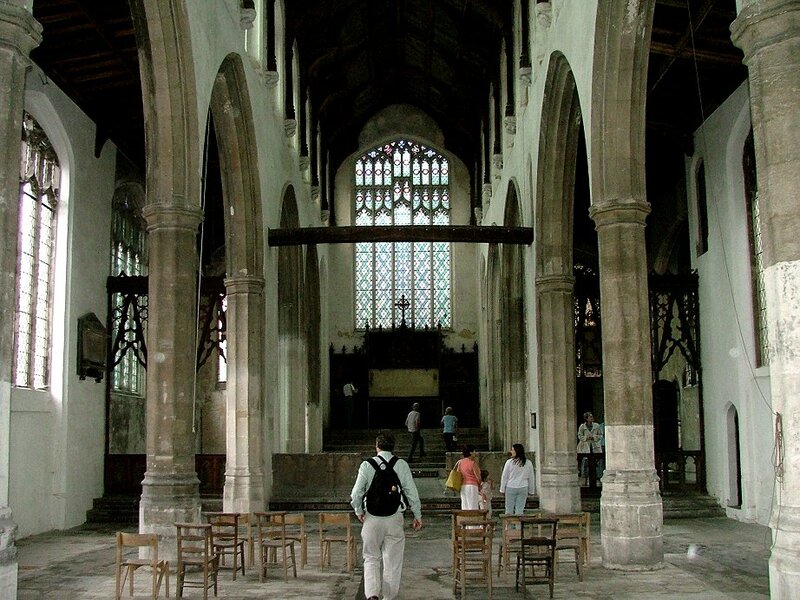 My friend Tom tells me that this church has a wonderful acoustic, and in truth it is hard to see it ever having any use other than for performance or liturgy - it is simply too big for conversion into anything else. 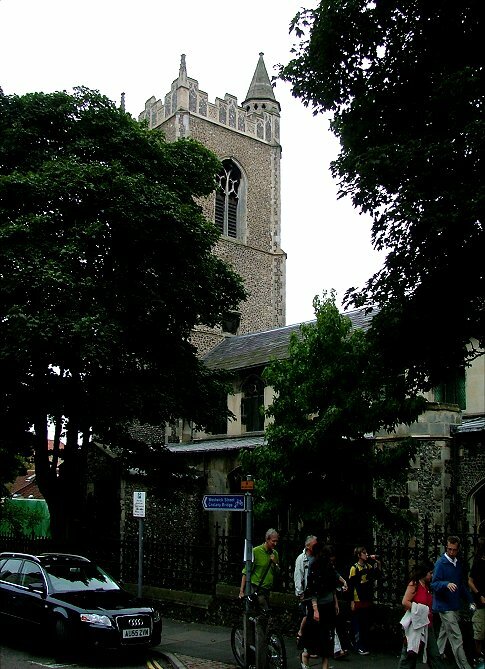 Its shell is recognised today as a vital part of the Norwich townscape, and that at least is now safe for future generations; but will it ever again be anything more than a shell?